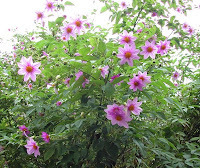 First, the Tree Dahlia, Dahlia tenuicaulis. A Flickr friend posted a lovely shot (not this one though) and it reminded me how much I wanted to try this one. Not sure how it will react to the warm humid Houston summers but it should like cool wet winters! 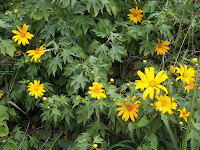 Second, the Sunflower Tree or Tree Marigold, Tithonia diversifolia. I've seen it growing in Tampa so I know for sure it will handle Houston! The bush I saw there could easily have been called a small tree - it was 12 feet high and covered in butterflies. There is a possibility it is an invasive species, from some of the reading I have done. So I will need to read some more before I dive in. I've already lived (and we are STILL living) the nightmare called ruellia. Do any of you have experience with these lovelies? The first two weeks of December have been dramatic. We have had warm humid sunny days, then cold, then warm, then back to cold and wet. Plants that grow well in Houston are tough! Today I checked the Giant Granadilla to see how it was holding up. After all, we have had freezing temperatures and this is a tropical plant. There are 11 buds, 4 of which have actually opened! This is the first time the vine has flowered since its first year back in 2003. I doubt we will have fruit, but it is fun to see these giant flowers. On our walk this morning, we discovered a treasure trove of discarded dianthus plants. The landscaper for the nearby office complex dumped a pile of plants in the empty field. By the time I spotted the pile, the marigolds had died. But there was an entire colony of pink and red dianthus thriving! So we hauled about 15 plants home and tucked them into the damp earth of the back garden. Dianthus are pretty hardy, and I have several plants that have survived for years. They suffer during the heat but if they are in a somewhat shaded location they will stumble through and then are in glory for the fall and winter months. Butterflies depend on their cheerful flowers for nectar, and I depend on them for a little color! One of my crepe myrtles has gorgeous yellow leaves - a nice surprise. Houston isn't known for fall colors, and there is nothing else in the yard with color. Tomorrow will be another humid day. Then we expect a cold front on Wednesday. I'm hoping for a freeze, to knock down the mosquito population! On the other hand, the giant granadilla will probably freeze back. snow on the roof, originally uploaded by AmyEmilia. 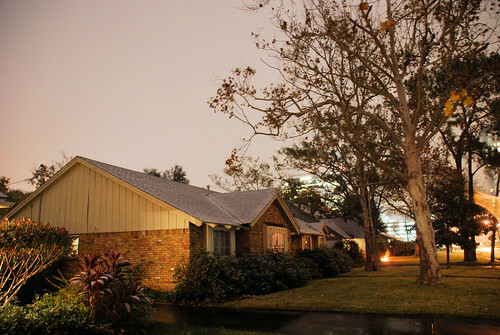 It's snowing in Houston! This is a fairly rare occurrence south of I-10. We don't expect it to last even until morning. But for now, it's nice to see the flakes falling. When I checked just a few minutes ago, the snow was already melted from the garbage can lid. But maybe we will wake up to a blanket of white. And I will have an excuse to wait a little while to go into work!